Giving Tuesday began as a way to unite the world in a day of global generosity – an encouragement and reminder to enter the holiday season by giving where it is needed most. This Giving Tuesday, please consider giving in the following ways. Your gifts will enable eDOT to function and expand in 2018. Your gift of $30 will grant a one month subscription to lynda.com to one of our team members so they may take course to sharpen their skills and develop their craft. We use this resource to develop our team members and equip them in sharing the Gospel. Your gift of $45 will cover one month’s cost of app development (this includes Google Play costs, backend server costs, purchased graphics, and other software). We have two VPN accounts which help our people to be security safe online when traveling and communicating with some of our partnerships. A gift of $70 will cover the annual cost for this service to help protect our missionaries. A gift of $83 will cover one month of server costs (including backup retention). This server helps us with our development process, it runs our websites and web apps, and it also hosts some of our partner websites. The cost of the Apple Developer License for iOS apps is $110 per year (this includes taxes). Adobe Creative Cloud (Adobe CC) is the industry standard software for graphics, design work, and development. We have three team members who use this subscription service on a daily basis. Your gift of $390 will cover the annual cost of one subscription. Our team is growing! We have two eDOTers in language school now, a family raising support to join us in Germany later, and we have had a consistent flow of interns in the past year and a half. Your gift of $400 will give them a place to sit and work. 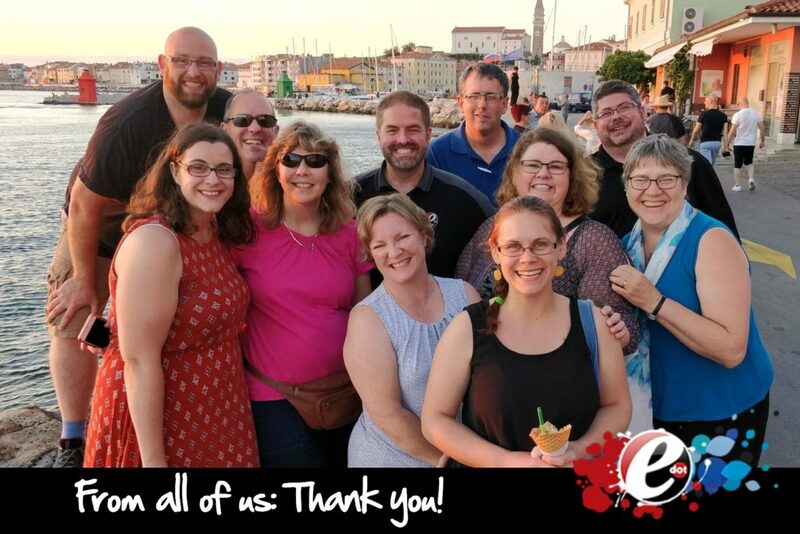 eDOT sends team members to ICCM-Europe to help lead and host this conference so that many more ministries in Europe can expand their mission of growing their ministries using technology. The cost is $575 per team member. This is the estimated cost to send a team member to consult with, train, and develop partnerships on location. Your gift of $1025 would cover our monthly office expenses. This includes rent, electricity, internet, insurance and other utilities.